Within a local or regional area, many ham radio repeater systems may use remote receivers that relay weak signals from outlying areas back to the main repeater transmitter. The relayed signal is transmitted over a control link, which is a dedicated transmitter and receiver operating on a VHF or UHF band. It’s not unusual for a repeater to have three or more remote receivers. To link repeaters over wide areas and long distances, however, it is common for repeater systems to use the Internet. Hams have three primary ways to link their repeaters via the Internet: EchoLink, D-STAR, and IRLP. 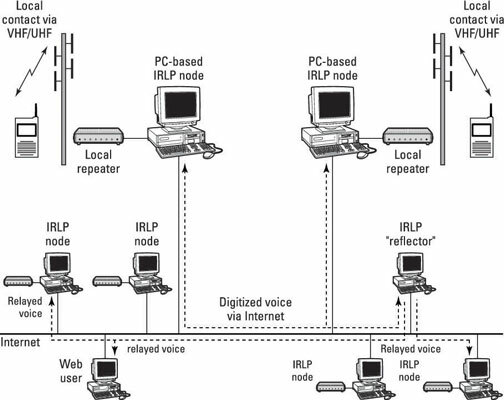 EchoLink and IRLP use Voice over Internet Protocol (VoIP) to share voice signals between repeater systems. D-STAR uses its own set of protocols to link individual and multiple repeaters through gateways. EchoLink and IRLP systems can be used by hams with any kind of FM voice radio. D-STAR’s digital voice protocol must be used by everyone on the system, requiring the use of D-STAR radios. D-STAR’s fully digital system also enables data-only operation, and many software applications have been developed to use that capability. All three systems are active, and more repeaters are linked to the systems every day. The IRLP system includes about 3,000 stations around the world. EchoLink currently lists more than 2,000 repeaters and more than 200 conference servers. The D-STAR system lists about 1,000 gateways, many serving more than one repeater. To find other hams who use these systems, you’ll want to join one of the online user groups. The links between repeaters and individual stations in the IRLP and EchoLink systems are controlled manually by the system users. When you’re connecting to either system beyond your local repeater, you must enter an access code manually. The code identifies the repeater system you want to use; then the system sets up the connection and routes the audio for you. When you finish, another code or a disconnect message ends the sharing. This overview is very simplified, of course, and both systems offer useful features beyond simple voice links. EchoLink systems can also be accessed directly from a computer via the Internet, so users don’t have to have a radio at all, making EchoLink a popular way to communicate if you don’t have a radio handy or are traveling away from your home repeater. D-STAR is not only a type of repeater system, but also a complete set of digital communication protocols for individual radios. A station that uses a D-STAR radio communicates by sending a stream of digitized audio over the air to another D-STAR radio or a D-STAR repeater. Regular FM voice radios can’t receive D-STAR signals, and vice versa. (Some radios can operate in either FM or D-STAR mode.) A D-STAR repeater receives the digital stream of data and retransmits it just like an FM repeater does, but still as digital data. Because the voice signal is already digital when it’s transmitted, it can be shared or relayed over digital networks easily. 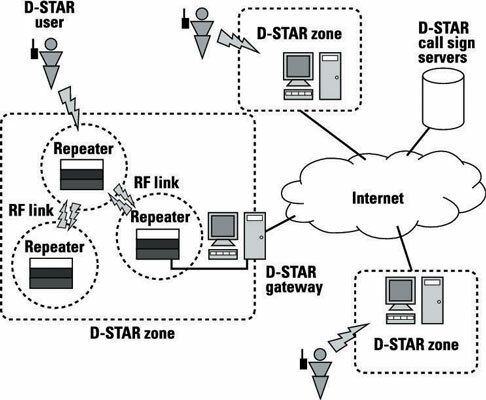 D-STAR repeaters are connected to the D-STAR system through gateways: computers that are connected to the repeater and to the Internet. Hams establish links from one D-STAR repeater to another by entering call signs into their D-STAR radios. The D-STAR system’s servers use these call signs to look up the low-level Internet network addresses of individual repeaters. Then the system directs each repeater to make the connection and share the voice data. Call-sign lookup is an interesting feature because hams don’t have to know where another ham is to contact that person; the D-STAR system remembers where each ham last used a D-STAR repeater. Calls to a specific ham are routed to his or her last-known D-STAR repeater. An IRLP node is a regular FM repeater with an Internet link for relaying digitized voice. A user or control operator can direct an IRLP node to connect to any other IRLP node. When the node-to-node connection is made, the audio on the two repeaters is exchanged, just as though both users were talking on the same repeater. It’s common for a ham in Europe to communicate with a ham in New Zealand, for example, with both parties using handheld radios that put out just a watt or two. Using the IRLP system is very much like using an autopatch system. You don’t need anything more than your radio, the IRLP system’s control-tone sequences for your repeater, and a list of the four-digit node on-codes that form the IRLP address of an active IRLP repeater. Enter an IRLP access code. The access code sets up the repeater to accept an IRLP on-code. This process is just like activating autopatch. When the repeater indicates that the IRLP system is ready, enter the tones that send the on-code of the repeater that you want to connect to. Entering the tone is just like entering a telephone number into an autopatch system. You can find a list of available IRLP nodes and their on-codes on their website. After a short delay, the node you connected to identifies itself in plain voice with a call sign and location, and you’re connected. Any transmissions that you make are retransmitted on the remote node, and you also hear all the audio from the other node. If the other node is busy with another IRLP connection, you hear a message to that effect. Try another node, or come back later. When you finish, use the IRLP control codes to disconnect, as with autopatch.